SALEM, Ore. — How much medical marijuana is in the pipeline in Oregon? The managers of the state’s program concede that they simply don’t know because of lax reporting by producers and a lack of site inspectors. That, they say, creates opportunities for marijuana to be diverted into the lucrative black market, something that federal authorities have long complained about. Oregon was one of the first states to legalize medical marijuana in 1998, and in 2014 voters approved allowing recreational use. The state’s struggle to transform a business that for decades had operated illegally in the shadows into a regulated industry sets an example for other states moving toward legalization. In an internal review released late Thursday, the state’s Health Authority, which oversees the Oregon Medical Marijuana Program (OMMP), admitted it has not provided effective oversight of growers and others in the industry. “Potentially erroneous reporting coupled with low reporting compliance makes it difficult to accurately track how much product is in the medical system. This limits OMMP’s ability to successfully identify and address potential diversion,” the report said. The report showed there were more than 20,000 medical-pot-grow sites, but only 58 inspections were carried out in 2017. Oregon Health Authority Director Patrick Allen ordered the internal review amid complaints from law-enforcement authorities who say they often have trouble identifying which marijuana growers are legal. Seen from a helicopter just before harvest season, marijuana grows are like a green patchwork across one southwestern county, one drug-enforcement officer said. In Deschutes County, the sheriff and district attorney in February went public with their frustrations, saying the state was allowing black-market operations to proliferate through lack of oversight. They asked the health authority to provide a list of medical-marijuana-grow sites, but the agency refused, saying the law doesn’t permit it to provide such a list. The agency could only respond on a case-by-case basis. The health authority said the confidentiality of grow-site addresses is protected by law, but added it’s exploring ways to work more closely with law enforcement to ensure medical-marijuana-grow sites are operating legally. “Those locations should be made available to law enforcement,” Deschutes County Sheriff Shane Nelson told The Associated Press on Friday in reaction to the report. The report cited “inadequate funding and staffing resources to meet the demands of robust regulation,” as one of its many challenges. “More than 40,000 Oregonians depend on medical marijuana to treat their qualifying medical conditions,” Allen said. The medical-marijuana program also lacks reliable, independent tools to validate grow-site locations, relying on inconsistent county databases, the report said. 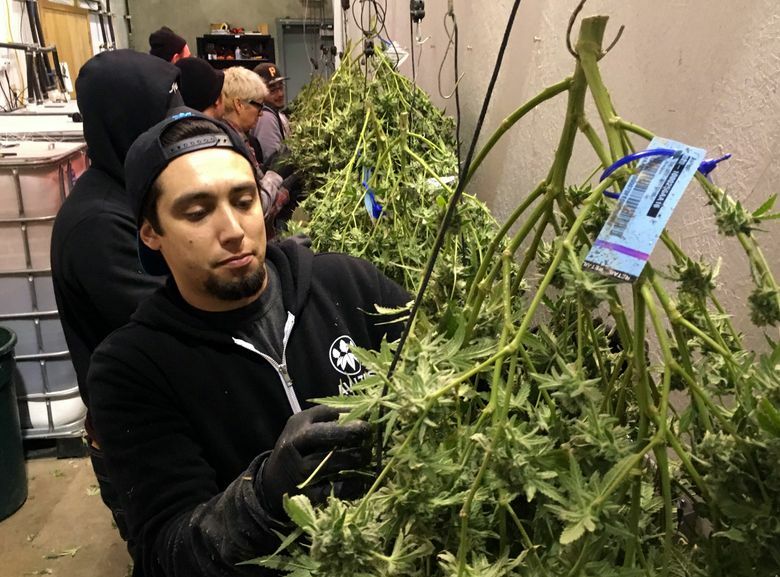 Oregon recently began requiring medical-marijuana growers of more than a dozen plants to enter a comprehensive seed-to-sale tracking system run by Oregon’s recreational-marijuana regulatory agency. That agency, the Oregon Liquor Control Commission, is adding around 20 staffers, including inspectors and data analysts, to handle the increased workload, liquor commission spokesman Mark Pettinger said. The review noted a sharp decline in the number of medical-marijuana dispensaries since adult-use recreational shops began opening in January 2017. That month, there were 172; by December 2017 there were only 19 as many medical-marijuana businesses switched over to the recreational side. Those with medical-marijuana cards obtained with a physician’s statement can buy their products at recreational shops, tax free. Recreational users pay a 17 percent state tax, plus any local add-on taxes. Deschutes County District Attorney John Hummel commended Allen for commissioning the study.